Crux Lies released today (8/17) their debut full length album The Hearth. The album was released via Cleopatra Records and is available on all streaming platforms as well as on CD via their Bandcamp page. In this album the band manages to masterfully blend the sounds of classic post punk with a newer, modern touch and approach. The result is beautiful melodies, clear vocals, and a nostalgic sound that takes one straight back to the 80’s. 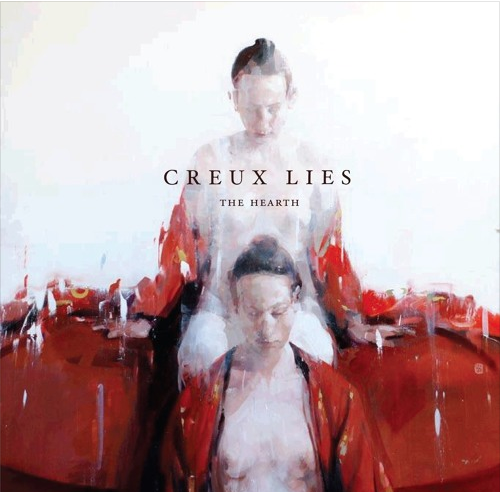 Creux Lies gave us a first taste of the sound of The Hearth with the single Portals, that was released mid July of this year to great response from fans and journalists. The album and its lyrics were influences by tarot and mysticism, particularly the concept of duality and/or confronting multiple problems at once. This point of view let the band to find the artist who would eventually do the cover art for the album, Alex Kanevsky. Creux Lies approached Kanevsky about the cover, to which the artist agreed after listening and liking the new album. The creation of the record was the product of a lot of experimenting. Some tracks are based of older songs, while others are the result of simple riffs and melodies coming to life in the studio while playing around with various instruments. Creux Lies also believes it would be remiss not to credit Californian red wine in the writing process of this album. The band completed the production of The Hearth in late 2017, recorded at Earthtone Studios in Sacramento. The album was tracked under the innovative care of producer/engineer Patrick Hills (King Woman, Tera Melos, So Stressed). Revered for use of reverb-laden guitar work, creative synth structures, and dynamic vocals akin to the style of many early shades of 80’s pop darkness, Creux Lies are known as an alternative / post-punk / new romantic-esq project from Sacramento, California. Created out of the band formerly known as NMBRSTTN, singer Ean Clevenger, guitarist Barry Crider, synth/electronics David Wright, drummer Topher Snyder, and bassist Kyle Vorst have focused their creative vision toward a new path of electro-drenched melancholy sonic styling. In late 2017, Creux Lies completed their first full-length, recorded at the creative fantasy-land known as Earthtone Studios in their home-city under the creative care of producer/engineer extraordinaire Patrick Hills. Their initial single and video, “Zone,” was released in January as a stand alone to much fanfare and commotion; as well as being added to several of the most notable genre-relevant playlists and radio broadcasts through out the world. They were also nominated for band of the week on Post-punk.com following the release and acclaim surrounding “Zone’s” release. The band signed to Cleopatra Records for their opening release, The Hearth, out now. Sharing stages with a roster of notable acts such as Clan of Xymox, Drab Majesty, Soft Kill, Glaare, Actors, Vowws and others, has encouraged Creux Lies to develop their own headlining performance antics, including powerful performances with a dramatic visual/light experience.